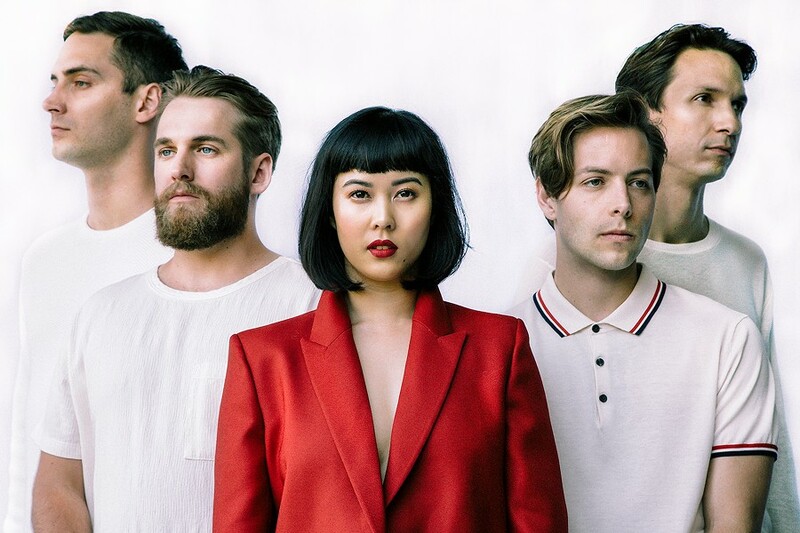 Courtesy photo Alisa Xayalith (center) fronts The Naked and Famous. In the case of The Naked and Famous, passion and pain have become inseparable. Simple Forms, the third album from the New Zealand indie-electronic quintet, comes after the band pushed through personal turmoil, as the band's two vocalists, Thom Powers and Alisa Xayalith split after an eight-year relationship. Rather than putting the band itself at a crossroads, the amicable (though painful) breakup is something the group leveraged for a creative spark, creating an album with moments of soft vulnerability and big, tension-releasing, elevating choruses, leading to an emotional but ultimately uplifting pop record. The remaining members of the band—keyboardist Aaron Short, bassist David Beadle and drummer Jesse Wood—may have been on the sidelines of the breakup, but nonetheless felt the intensity of the situation rippling through the songwriting and recording sessions. "They went through this big breakup and it was tough on everyone around them as well," Wood says. "The last tour we did was pretty tiring and put everyone through a lot of stress and pressure. Luckily we worked hard enough on the first two records to buy ourselves some time. If we did have to rush back into the studio straight away it probably wouldn't have worked." Those first two records, 2010's Passive Me, Aggressive You and 2013's In Rolling Waves, were huge smashes in New Zealand, both leading to Best Group honors at the New Zealand Music Awards and widespread, international acclaim. Like In Rolling Waves, The Naked and Famous recorded Simple Forms in their new home base of Los Angeles, and despite any personal difficulty, the process found the band more confident and in control in the studio. "Going into the studio for the second record was more stressful, but coming around for the third time it was more comfortable and relaxed," Wood says. "It's not like we've moved in with a LA producer who's telling us what to do or what to wear. It hasn't changed our working dynamic at all. It's still very internal as far as the creative process goes." For Simple Forms, Powers, who has produced all three of the band's albums, worked to create a more dynamic sound, emphasizing the tension and release in the songs, both lyrically and musically. "A lot of the writing was more pop-oriented, more vocal heavy and a little more direct," Wood says. "This record is a lot more immediate than the last one, and more upbeat and polished,"
"Higher," the first single, sets the album's tone, and the band makes the most of the light-dark contrast in both lyrics and sound. Released in July, the song speaks to the experience of love, loss and emerging from the pain as even stronger people. "That had been in the works a while, so it was the first song we were all working on as a group. It's been through so many iterations, it's good to have it finally out there," Wood says. "That was kind of the benchmark for the rest of the album. Once we had it finished, it was the template and the rest of the album came out a lot easier."